WAC monochrome context image of the Reiner Gamma swirl. Arrow indicates approximate location of NAC detail in main image. The heart of the Constellation region of interest in the Reiner Gamma swirl. Astronauts exploring this region will address longstanding questions about the origins of this distinctive natural feature. Image width is 510 meters or 1673 feet. First identified by early astronomers during the Renaissance, the Reiner Gamma formation has been a subject of intense scientific study for almost five decades and is one of the highest-priority targets for future human lunar exploration. Reiner Gamma is one of the most distinctive natural features on the Moon. 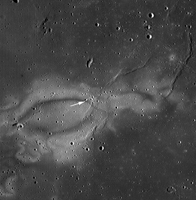 The striking, tadpole-shaped swirl in WAC monochrome has a significantly higher reflectance than the surrounding mare basalts.